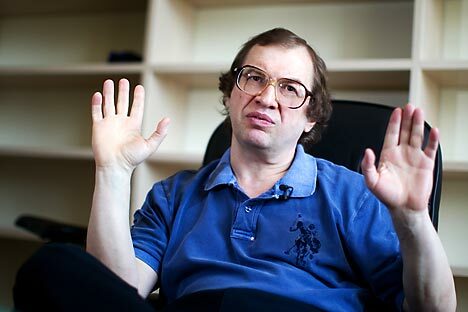 Sergei Mavrodi founded the notorious financial pyramid in the 1990s and his new project is expanding with a vengeance. To what extent such pyramid schemes can be dangerous in the Internet era? It’s 2012, and MMM – the company behind Russia’s most notorious pyramid scheme – is reopening offices. Sitting in his office at 16 Pushkarev Lane, in the center of Moscow, Andrei Kim, head of the MMM-2011 Information Counseling Center Club reported that 15 million people from across the former Soviet space have invested in Sergei Mavrodi’s new pyramid scheme since its launch in January 2011. This office is one of 150 similar organizations operating under the same brand. Related: Will Russia’s Madoff strike again? The space features a lobby with a coffee machine, three not especially spacious offices, and a small warehouse for promotional products. The company is now publishing books and newspapers in addition to brochures. There’s a hall for a few dozen people where they hold training sessions and lectures for new and existing participants in the system. Andrei Kim calls himself an ardent supporter of Sergei Mavrodi’s ideas. In his office, there’s even a small bust of the great schemer. “I’ve already booked a stone craftsman to carve us a life-size bust of Sergei Panteleevich [Mavrodi],” said Kim. He claims that in August 1994, when riot police shut down MMM’s head office on Varshavskoye Highway, he lost $200,000. He wouldn’t say whether he has earned a comparable amount through the new pyramid scheme, but he notes that he is waiting for Mavrodi to return the $200,000 to him: a year ago, the MMM founder promised to compensate victims for losses in all the Russian pyramid schemes. Andrei Kim joined MMM-2011 in February 2011. Participants in the MMM system are divided into thousands, hundreds, and tens, and each cell has a manager––called, respectively, a thousand’s manager, hundred’s manager, and ten’s manager. Kim has been a hundred-thousand’s manager since November of last year. What he did before that, he doesn’t say. And now heading the structure that he calls the MMM-Guard is his only occupation. Kim says that he manages a sum of 100 million rubles ($3.3 million). According to Kim, the MMM-Guard has 10 offices, five of them in Moscow. Kim insists that he has not yet faced pressure or even interest from the authorities. Authorities do not seem to notice Mavrodi’s new project, although there are a ton of videos on his website, like the one where a successful participant in the project is inside a BMW dealership, handing over documents for a new X6. The MMM-2011 rules have hardly changed in a year. The base rate of return is 20 percent per month, or nearly 800 percent per year through a compound interest scheme. In addition, the system has deposit programs with a rate of return of 75 percent per month. To join the system, you have to register at sergey-mavrodi.com and wait for someone to contact you, or else find your own ten’s manager––the most active have their own websites. The idea is that you can enter with any amount but, for example, Andrei Kim’s MMM-Guard no longer accepts deposits of less than 30,000 rubles ($1,000). The ten’s manager will offer to transfer money to the cell’s bank account. You can keep your money to yourself (for this it is recommended that you open an account with Sberbank), but doing any transactions with them independently is prohibited. A ten’s manager may request a cash flow statement at any time. Incentives are provided to attract new participants: 20 percent with the first transfer and 10 percent with each additional one. Cell leaders are also paid for their work: a ten’s manager receives 5 percent for any payment to his cell, a hundred’s manager 3 percent, and a thousand’s manager 1 percent. A year ago, the Federal Antimonopoly Service sent the Ministry of the Interior the opinion of its Expert Board recognizing MMM-2011 as a financial pyramid scheme. The meeting that preceded this was attended by State Duma deputies and representatives from the Ministry of Economic Development, the Ministry of Finance, and the Federal Financial Markets Service. However, at the beginning of last year, some regional duma deputies and representatives of the Federal Antimonopoly Service made several attempts to stop Mavrodi. In the Kirov, Omsk, and Stavropol Regions, they succeeded in removing billboards advertising MMM. Opponents of MMM often have success using a law that requires advertising for banking, insurance, and other financial services to include the title or name of the person providing the service – with the decentralized MMM-2011, there is no such person. In May of last year, the local prosecutor’s office in Taganrog reported that it was able to force local ISPs to block access to the site sergeymavrodi.blogspot.com on the grounds that it “had all the signs of a financial pyramid scheme.” This triumph by law enforcement agencies was spoiled by the fact that by that time, the address of Mavrodi’s site had already been changed to sergey-mavrodi.com. Hundreds manager Konstantin Guriev of Sevastopol said: “So far, there are no twists and turns. There was an issue––they removed our ad from billboards. But how could the administration enforce that? Many of our structures were illegally installed. So I made arrangements with the owners of the buildings to hang ads on the buildings. In a personal capacity.” Guriev has participated in the system from the very start. Three weeks ago, he opened an office. “In fact, for the last many years I worked as a director at a major firm, and then the contract ended,” he said. “I sat there for two weeks on the Internet, examined everything and joined. At first I put in 30,000 hryvna. A month later, I had 45,000––this is taking into account a holiday bonus. I earned 15,000, my former salary, effectively doing nothing. And now I have participants who, for every 200,000 they lay down, earn 100,000 per month.” Guriev says this is the fourth Sevastopol office. According to Mavrodi’s website, there are about 50 offices in Ukraine alone. Several branches have also opened in Kazakhstan, Kyrgyzstan, Lithuania, and Belarus. One office operates in Athens. Why are the authorities silent? The answer is superficial: the pyramid has not yet collapsed, and no one really knows how many people are involved in it. With MMM-2011 having more and more offline outposts, they are luring people far from the Internet audience.